EPIC Waters is a stunning 80,000 square foot indoor waterpark that opened in early 2018. 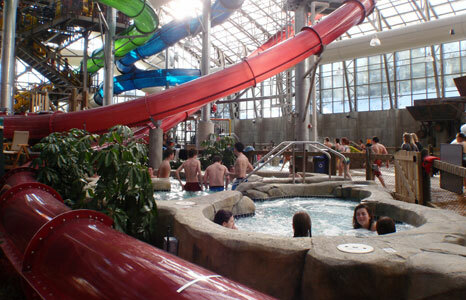 The waterpark includes six WhiteWater waterslides; a FlowRider; activity pool with play features; wading pool with a multi-level play structure; small features and play areas for young children; offerings for both children and adults; lazy river with beach entry and wave system; and an outdoor wave pool. 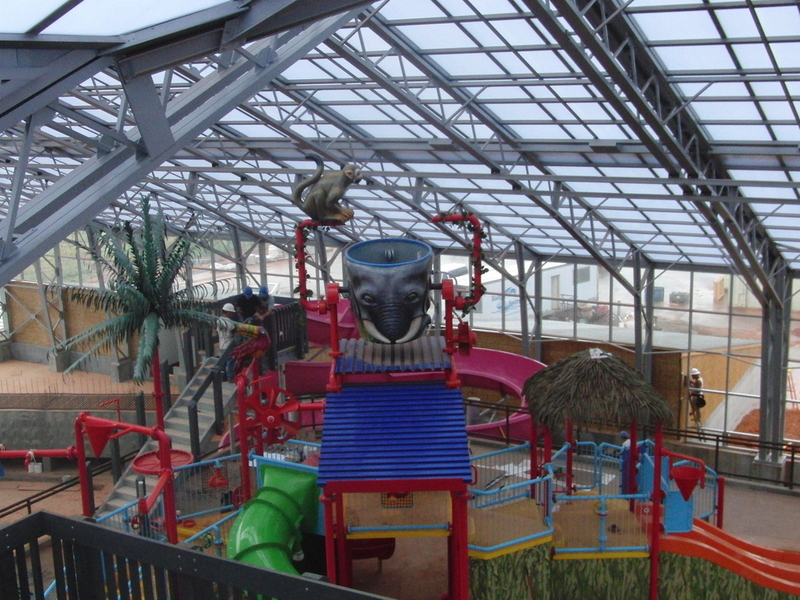 The waterpark building includes an OpenAire structure with a retractable roof; movie screens, video and projection equipment; LED light displays/features; party rooms; snack bar; sports bar; retail store; arcade; cabanas; landscaped outdoor space with beach and deck areas; lifeguard staff area; building mechanical area and pool equipment rooms. The pools and features design were developed in a manner that complements and is cohesive with these components. The EPIC recreation center includes a 4-lane lap pool; water slide with runout; multi-purpose pool with beach entry, wading area with play structure current channel, and exercise/fitness area; and an elevated whirlpool spa. This 40,000 square foot indoor waterpark utilizes the latest technologies for energy efficiency, including a translucent OpenAire building structural system and a shared heating system between the waterpark and hotel. Exciting features include the first indoor AquaLoop in the United States, a swimming hole with a climbing wall, two tube slides, one body slide, a wading pool with multi-level play feature and a surf feature! For those looking to relax, there is a large 700 foot leisure river, indoor and outdoor spas, and an outdoor lounging pool. 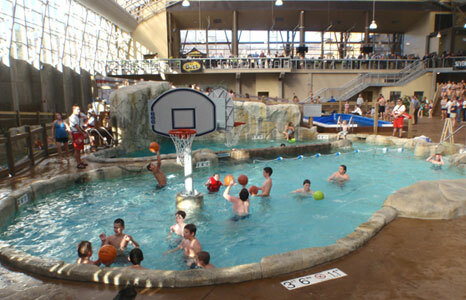 New Mexico’s first indoor waterpark! The 30,000 square foot waterpark addition includes audio, video, and lighting effects as some of the many amenities enhancing the playful and whimsical "art deco" aura of this aquatic recreation facility. Water play and leisure attractions include: body and inner tube water slides, a lazy river, an activity pool with waterwalk and basketball, a wading pool with an interactive play feature, an indoor/outdoor spa, a two-person FlowRider, and a hi-resolution water screen for video and image display. The mezzanine includes the Surf’s Up Snack Shack, Arcadia family entertainment center, and observation seating. A vista of the waterpark and port holes for FlowRider viewing are also available from the mezzanine. The atmosphere in the park is enhanced by the premium air and water quality management system. Generous amounts of fresh air from the energy recovery units and advanced water treatment systems create an enjoyable guest experience. Click here for a 360° view of the completed waterpark. 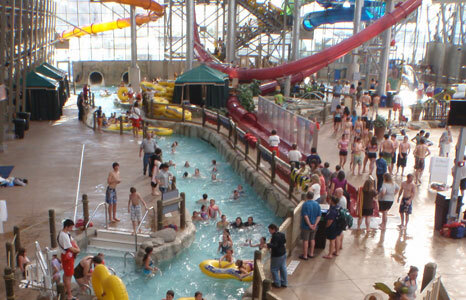 The Wisconsin Association of Consulting Engineers presented an "Engineering Excellence Achievement" award to RAMAKER for the indoor water park at the Kalahari Resort & Convention Center. 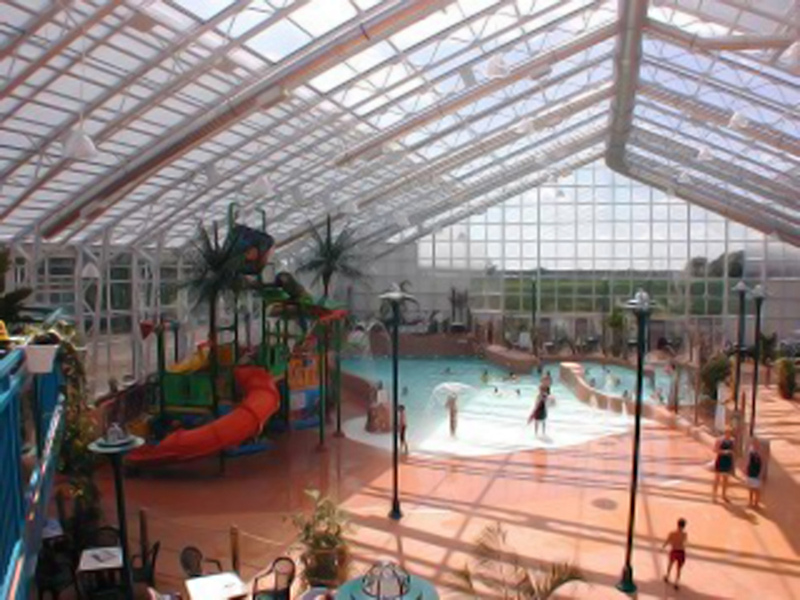 This $40-million resort complex opened in May 2000 and has the largest indoor water park in the Midwest. They have since doubled the size of the indoor water park in addition to adding a large outdoor waterpark. This facility includes everything from gentle waves in the wave pool to extreme thrills with the Master Blaster, Flowrider, and other unique waterslides. The outdoor waterpark spans five acres and has had numerous phases of development over the years. Beginning with the Family Land Waterpark and the Treasure Island Resort, RAMAKER has been involved with every new aquatic feature added since 1992. In 2005, Family Land Waterpark and Treasure Island Resort joined forces with Mt. Olympus Theme Park to become a major destination in the Wisconsin Dells. Key aquatic features added include the Bay of Dreams 50,000 square foot indoor waterpark, two 60-foot high family raft rides along with a 6-lane mat racing slide complex, and 55,000 square foot surf pool that generates a 9-foot wave. The Wilderness has grown to include six different waterparks on the grounds. 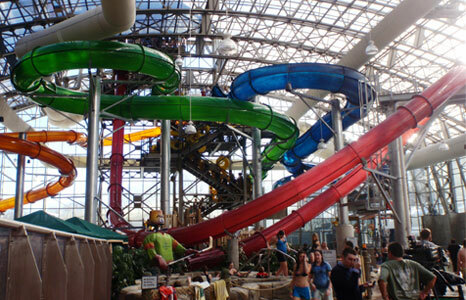 Indoor waterparks include: the Wild West Waterpark at 70,000 square feet; Klondike Kavern, which boasts 65,000 square feet; and the Wild WaterDome, surpassing 70,000 square feet. 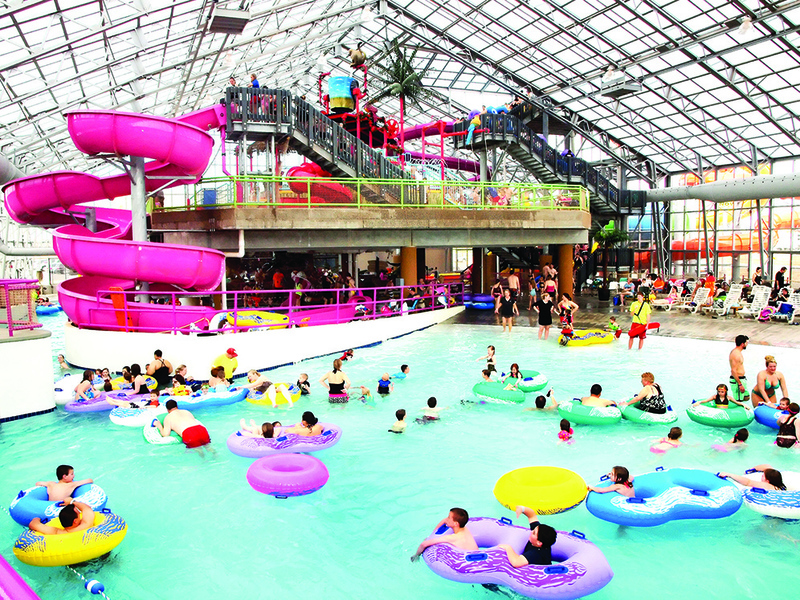 These waterparks feature unique rides including the Dells’ only 5-person raging raft ride; a four-story interactive play feature with body slides, cannons, turrets and water blasters; and the area's only indoor Bumper Boats! Other waterpark features include speed slides; indoor/outdoor spas; an indoor wave pool and two additional family raft rides. Outdoor waterparks include: Lake Wilderness at 40,000 square feet; the Lost World Waterpark, which spans 3.2 acres; and the New Frontier Waterpark, amounting to 110,000 square feet. 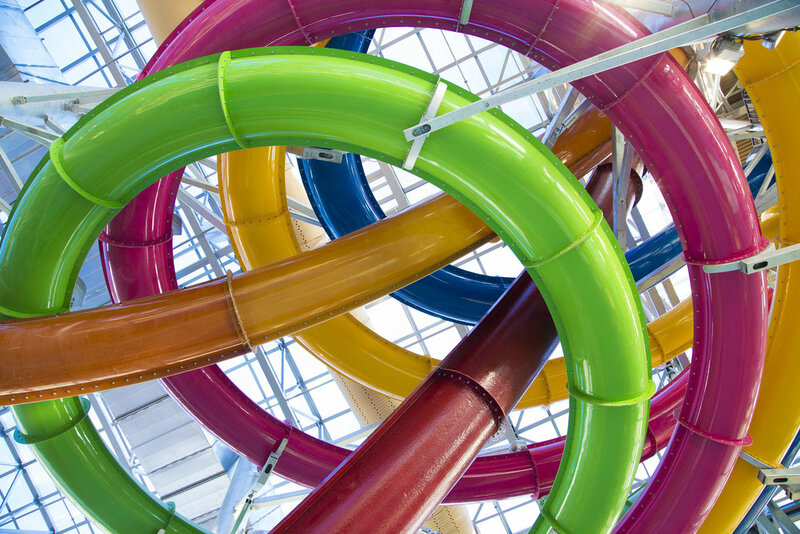 These waterparks feature multiple tube and body slides, speed slides, lazy rivers, waterfalls, spas, and kids’ activity areas including hands on play-and-spray devices. The newest outdoor attraction, Lost World Waterpark, is home to an interactive river ride taking guests on everything from raging rapids to lazy river sections and from uphill currents to beach runoffs! This fast river ride will take you both uphill and downhill! Over the last couple decades, RAMAKER has provided a variety of services, including geotechnical analysis, aquatic engineering, structural engineering, civil engineering, and land surveying. 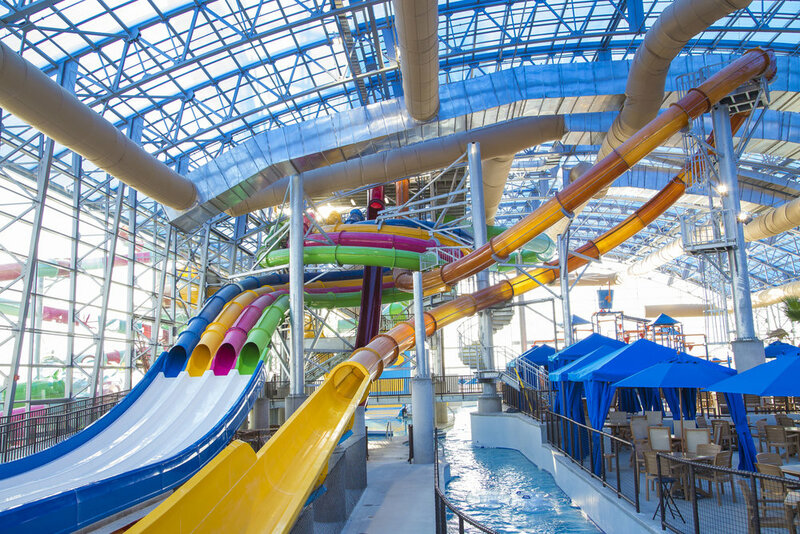 This 70,000 square foot indoor waterpark features the world's highest indoor slide tower and the first indoor surfing machine in Minnesota. 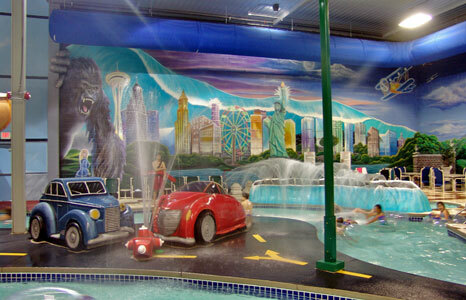 A wave pool, action river, state-of-the-art interactive and multi-level play feature also thrill guests. RAMAKER's services provided included aquatic, mechanical, electrical, and plumbing design, along with construction management. This new 100-room hotel and attached 30,000 square foot waterpark is a unique entertainment complex in Eau Claire. Action City provides 55,000 square feet of entertainment for all ages with go-karts, bumper cars, laser tag, mini-bowling, a climbing wall, batting cages, and mini golf, 85 arcade games and more! An indoor sports arena and convention and catering facility within the hotel also draw visitors to the area. 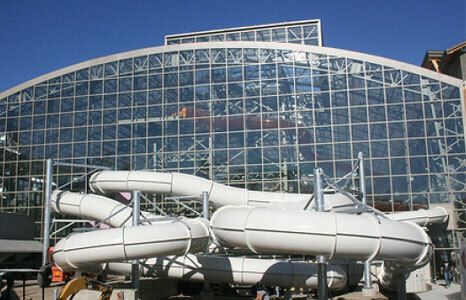 RAMAKER designed the MEP systems for the waterpark and the hotel. 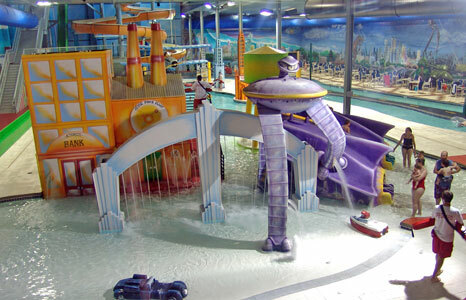 We also designed and provided aquatic engineering services for the entire waterpark. The hotel is heated and cooled with water source heat pumps. To make the MEP system more efficient, the system was designed to allow waste heat from the hotel to be transferred to the waterpark for heating the pool water. Step into the Wild at Water-Zoo Indoor Waterpark where it is 80 degrees year-round. 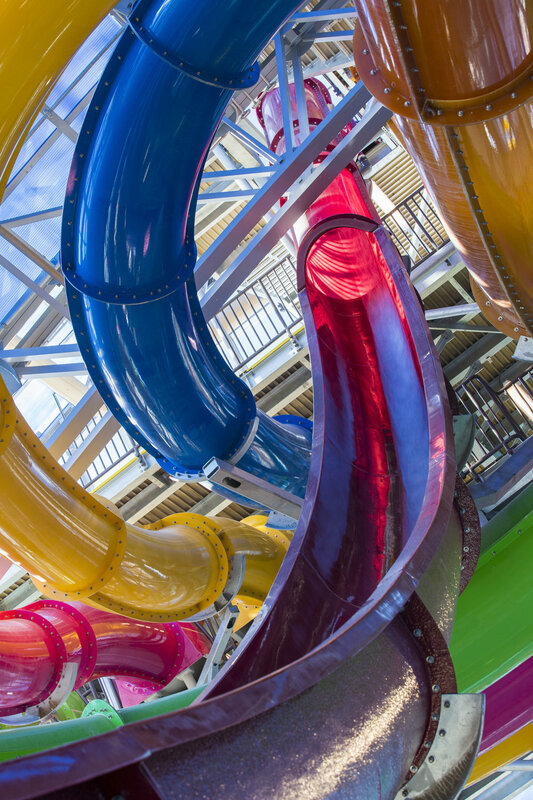 With more than 200,000 gallons of water, 1,000 feet of water slides, a retractable roof, and lots of sprays and splashes, staying indoors has never been so much fun! This facility is packed with fun, including a lazy river; wave pool; slide tower complex with two body slides, one tube slide, and one bowl slide; a splash pad with a multilevel interactive play structure; and a toddler pool with kiddie features. The over 24,000 square foot waterpark is housed in a breathtaking OpenAire building structure that allows natural light in, while maintaining is cozy atmosphere. The design and engineering also include utilizing water-source heat pumps, variable frequency drives, and a heat recovery system to increase swimmer comfort and reduce operating expenses for the owner. The services provided include architectural and aquatic design, MEP engineering, and construction administration.